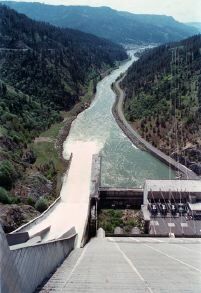 OROFINO, Idaho -- An engineering firm will begin work soon to repair leaks at north-central Idaho's Dworshak Dam. The U.S. Army Corps of Engineers has hired Jacobs Engineering of Seattle to inject urethane in joints between some of the huge concrete blocks that make up the dam. The Lewiston Tribune reports that water stops between six of the 51 concrete monoliths that make up the dam are leaking badly. Engineers say the leaks don't threaten the structural integrity of the dam, but they do make it more difficult for officials to monitor water slipping beneath the structure. Water leaking under a dam can cause tremendous uplift pressure that can, in extreme cases, undermine the safety of the structure. The engineering firm will start with just two of the leaky water stops. If the fix is successful, corps officials will seek funding to inject urethane into other leaking joints. Cash for the $1.3 million job comes from the American Recovery and Reinvestment Act. "This is a world-class engineering effort. This is the first time in the world we know of this material has been used on a high-head dam," said Allan Pomraning, dam safety project manager for the Walla Walla District. Work will begin in September, Pomraning said. "The whole idea is to get the worst of the worst," he said. The urethane works by soaking up water and then expanding to seal the joints. The expansion process takes about a month. The corps is also working on a $1.9 million project to install additional instruments at the dam to measure uplift pressure and stress on cracks in the concrete. That money also comes from the federal stimulus package. Both contracts are part of the risk reduction measures outlined by the corps two years ago when it released a dam safety assessment for Dworshak. That assessment rated Dworshak a 2 on a scale of 1 to 4. A 2 classification indicates the dam is "unsafe or potentially unsafe." Still, corps officials say despite the rating Dworshak Dam is safe, and that it received the low score not because there is a real threat of failure but because if it were to fail, the loss of human life and property would be high.